Paul Eades, Apiary Manager for Pembrokeshire Beekeepers’ Association, will be giving a talk about the ‘Pembrokeshire Beekeeping Centre’ on Sunday 22nd February, at the Small World Theatre in Cardigan. 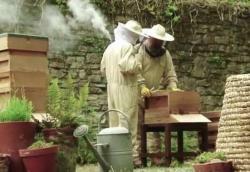 The talk will then be followed by a ‘Beekeepers Question Time’ featuring Ceri Morgan, former Bee Inspector and proprietor of Mel Bae Ceredigion, Irma Richardson of the Teifiside Beekeepers Association and Robert Jones a local beekeeper with 30 years‘ experience of breeding native bees. Tickets are £3.00 and the event starts at 10.30am.